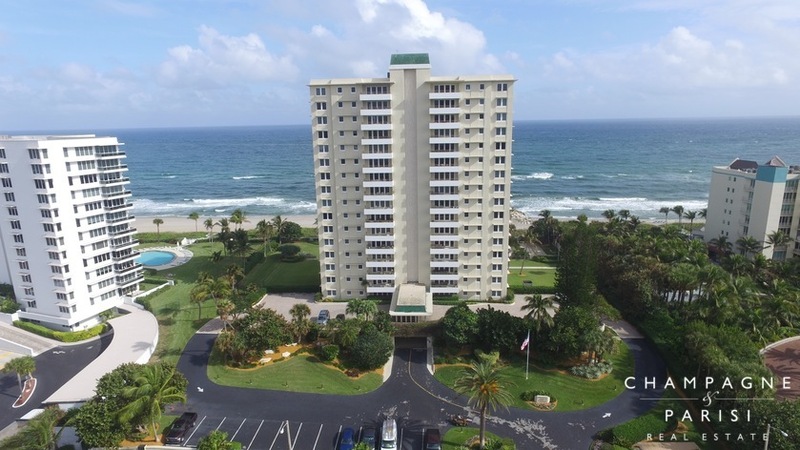 Sabal Ridge is an oceanfront luxury condominium building located in the heart of Boca Raton, FL. This active adult (55+) community consists of a single 17-story building with just 31 units. With only two units per floor, this building offers residents the ultimate peace and privacy in oceanfront condominium living. Condos for sale in Sabal Ridge offer three bedrooms or six bedrooms for double residences, and range in size from 2,750 to 6,000 square feet of luxurious beachfront living space. Originally built in 1968 by the Arvida Corporation, many units in Sabal Ridge have been elegantly remodeled and include many well-appointed features. Condos feature sleek marble or wood flooring, chef-inspired kitchens with granite countertops, high-end stainless steel appliances, and custom cabinetry, wet bars, spacious foyers, large master suites with walk-in closets, in-unit washers and dryers, and hurricane impact glass windows. Condos in Sabal Ridge also offer multiple balconies with sweeping views of the Atlantic Ocean, Intracoastal Waterway, Lake Boca Raton, and the surrounding tropical landscape. This active adult community offers residents a variety of resort-style amenities that can be enjoyed year round. Sabal Ridge is ideally located on A1A just north of Camino Real between the Atlantic Ocean and Lake Boca Raton. This prime location is convenient to many of the area's community parks, including the beautiful South Inlet Park which offers swimming, fishing, walking trails, playgrounds, covered picnic areas, and a beachfront pavilion. Sabal Ridge is close to some of the area's finest entertainment, shopping, and restaurants in downtown Boca Raton and Mizner Park, one of Boca's most popular destinations. Nearby are also the exclusive Boca Beach Club and the world-class Boca Raton Resort & Club. This intimate community is one of the most highly desirable oceanfront condominium communities in Boca Raton, with its premier location, luxurious residences, and spectacular views. If Sabal Ridge sounds like a place that you would love to call home, you may also want to visit the nearby condominium communities of Sabal Point, Sabal Shores, and Chalfonte, which also offer premier oceanfront condominium living in Boca Raton. If you would like to learn more about Sabal Ridge or any of the surrounding condominiums in Boca Raton, please contact us at 561-998-9015. You may also reach us by completing our online contact form provided below. We at Champagne & Parisi Real Estate look forward to assisting you in finding your next dream home in always sunny Boca Raton!